> Protect your bees from wasp invasion! 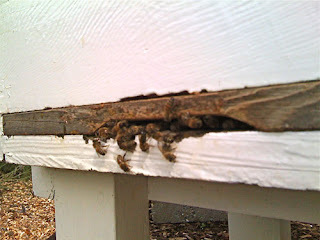 At this time of year wasps have expanded to their largest nest population and are looking for food. Wasps are sugar junkies and as the season comes to an end, so do their natural food resources, hence they turn their attention to robbing. Your beehives offer the perfect solution- sweet honey and sweet honeybees! Wasps will not only sneak into a hive to steal the honey but will also bite a bee in half and fly away with the abdomen to feed to their colony. If your hive is left unprotected, wasps can quickly outnumber your bees and overrun your colony destroying the hive. 2) Put out eco-friendly wasp traps. You can make them yourself or we sell a professional wasp trap that works REALLY well! (See photo 2.) The unit comes with a sachet of powder bait enhancers. We use these throughout our sites with great results. It traps the scout wasps and reduces your site location being reported back to the wasp colony, which would in turn send more and more wasps to attack your beehive. 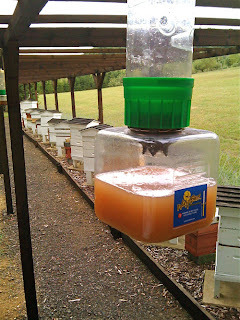 3) Do not spill any honey, wax comb or sugar syrup near your hive or within your apiary site. Keep all brood frames and supers covered and in bags when not in use. Simple rule: Keep all apiary equipment clean and covered to avoid attracting bees and wasps to your location. Once they find you its very hard to get rid of them.